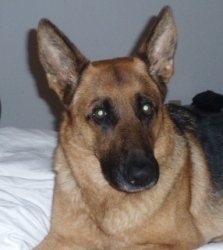 Nitza is a beautiful German Shepherd from Schutzhund stock. Her owner, Brianna was using traditional methods to train her and knew there had to be a better way. Nitza has a wonderful temperament but was simply unruly, unresponsive in many situations, especially with high distractions or around other dogs. While her obedience was coming along, her manners were not. She looked like a high strung, anxious, inattentive bundle of nerves when she first came to Canine Transformations. My first comment after just five training sessions and a hiatus in between was that "Nitza looks like a different dog". Brianna had taken all learning plans very serious and spent time in her training. While her story is not finished, the results, in just six sessions, speak for themselves. Nitza is well on her way with reward-based, non-confrontational training to not just being a wonderfully mannered companion, but it is Brianna's hope to achieve getting her BH in Schutzhund.